Show your love for special people this year with the Christmas mantel: Our 9 grandkids personalized Christmas ornament that is radiant with beauty. 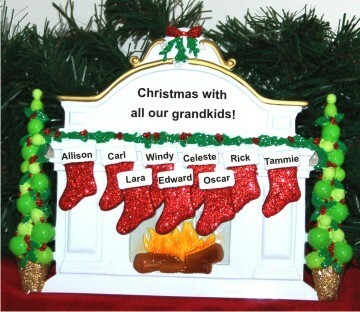 Each of these grandparents ornaments personalized for the recipients is lettered by hand in a very pretty font. One of our collection of tabletop ornaments for display on tables, shelves and countertops, the Christmas mantel and stockings 9 grandkids tabletop personalized Christmas ornament be a delight this and every year.